Breakfast is known by many as the most important meal of the day – but despite this, it’s often the meal that gets the least amount of love. When there’s little time in the morning, it’s easy to deprioritise breakfast and opt for the boring and unhealthy piece of toast, cereal, or worst-of-all nothing. If you start your day well – feeling energised and positive – it’ll help you start the day feeling good, and give you the best chance of having a great day. That’s why we’ve come up with 7 healthy breakfast recipes, which will help increase your energy levels and keep your hunger at bay too. 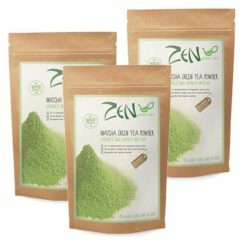 They all feature the superfood matcha green tea powder; a powerhouse of antioxidants that’s renowned for it’s health benefits. One single serving is known to contain 137 X more antioxidants than standard green tea, which is why it can increase energy levels, boost the metabolism, prevent hunger cravings, and protect your overall health. 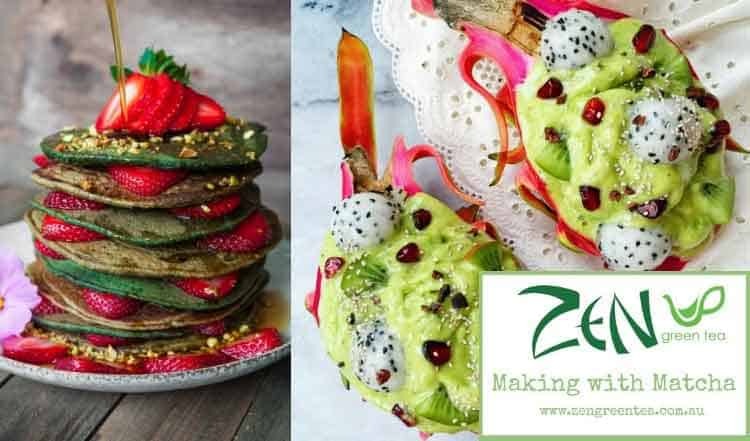 So read on for 7 healthy matcha breakfast recipes that are delicious, healthy and will kickstart your day! This matcha smoothie bowl is so quick to make, that it’s the perfect breakfast to whip up if you’re in a hurry before you dash out to work. Decorate with your favourite fruits and nuts to spice it up, if you want some added variety! Decorate with your favourite fruits. We love using what’s in season! So for summer, its all about mango, pomegranate, berries. Winter is melons, strawberries and toasted nuts. This is a wonderful take on the old classic. The added matcha in the lemoney sauce gives it a wonderful green colour, as well as all that added health benefits too! This combination may sound a little unusual at first, but believe us – the taste is worth trying! In a bowl, mix together the melted butter, Greek yogurt, lemon juice, matcha powder, salt and garlic powder. Mix thoroughly, and little by little add the warm water to make a sauce. To poach the eggs, fill a large saucepan with water and the vinegar. Bring to a gentle boil. Crack the eggs into the saucepan and heat for 3 minutes. While the eggs are poaching, slice your muffins in half and pop in the toaster. When the egg whites become opaque, remove them from the saucepan. To serve, slice the toasted muffins in half, and place the poached eggs on the muffin halves. Spoon the matcha sauce over the eggs, and garnish with spinach or chives. We love to make these to impress friends at the weekend! In a bowl, mix together all the dry ingredients – the matcha, flour, baking powder, and baking soda. Add the coconut oil, and then pour in the coconut milk. Preheat the waffle maker, and spray it with a little coconut oil. Ladle the waffle mix into the waffle maker and cook until golden brown. (Try not to overfill to keep the shape pretty). To serve, drizzle over maple syrup and dark chocolate (if using), and top with blueberries and grapes. You can make this matcha chia pudding the night before, so it’s easy to grab from the fridge before you head into work. It requires zero cooking skills, as you only need to stir everything together…and voila! Leave overnight and you can reap all the health benefits the following day. In a bowl, stir the chia seeds with the almond or cashew milk. Add the maple syrup or honey. In a separate bowl, mix the matcha powder with a little hot water until dissolved. Add to the chia seed milk mix. Add the vanilla extract, and stir well. Place the bowl in the fridge and sit overnight. In the morning, take out from the fridge in the morning, add your preferred toppings and enjoy! Shop-bought granola can often be deceptively high in sugars that make it more of a dessert than breakfast. This can cause sugar highs and lows, which can wreak havoc on your energy levels throughout the day. Instead, you can control your sugar levels by making your own healthy alternative. This matcha granola layered with blueberries and other superfoods will provide you with tons of antioxidants and help increase your energy levels to set you up for the day. Heat oven to 260º F.
In a large mixing bowl, combine the oats, almonds, walnuts, seeds, and vanilla extract together. In another bowl, mix together the melted oil, maple syrup and salt. Combine these two mixtures together, and toss to coat. Line two square baking dishes with parchment paper and bake the oat mixture by dividing it into two parts. Bake for around 1 hour, stirring from time to time, until it’s golden and toasted. Take out the dish from the oven and scrape the oat mixture into a bowl. Let it cool for 30 minutes, then sprinkle the matcha over and toss to combine. Finally, add the blueberries to it and give it a final toss. To serve, sprinkle the granola over a dollop of coconut yoghurt and enjoy! 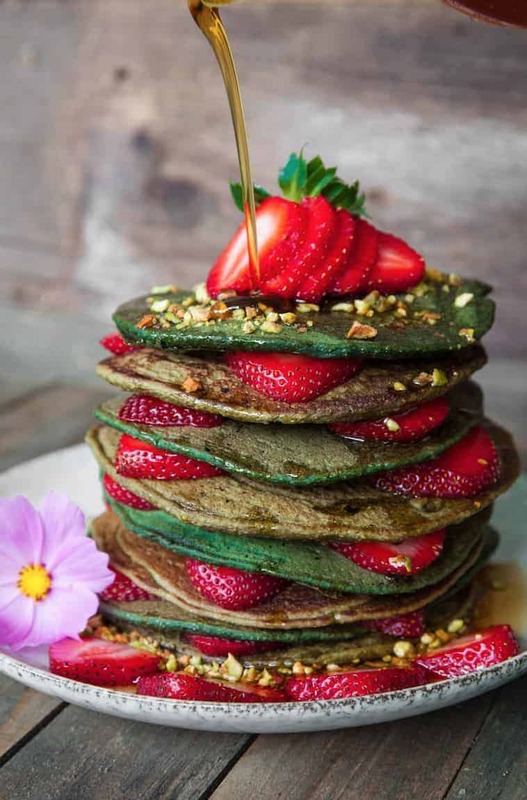 These delicious matcha pancakes are another perfect weekend brunch recipe. With a vibrant green colour, they look amazing so are sure to impress your friends! To make the pancake mix, whisk the eggs with the milk and vanilla essence in a jug. In a separate large bowl, sift the flour and matcha. Stir in the sugar. Make a well in the centre, and then pour in the egg, milk and vanilla mix. Whisk until just combined. You can leave the batter on the side (covered), until you’re ready to cook your pancakes. Heat a large non-stick frying pan over medium heat. Grease the pan with butter or coconut oil. Pour ¼ cup of pancake batter for each pancake into the pan. You should be able to cook 2 pancakes at at time. Cook the pancakes for 2 minutes one one side, or until bubbles appear on surface. Flip and cook for a further 1-2 minutes to cook through. Transfer each pancake to a warm plate. Cover loosely with foil to keep warm. Repeat with the remaining mixture, greasing the pan with more butter or oil between batches. Stack in a tall tower with some sliced strawberries and chopped pistachios amongst the pancakes. Drizzle the maple syrup all over, and enjoy! Our matcha green tea powder overnight oats recipe takes 5 minutes to make and is a delicious, healthy and filling breakfast option to keep you going all day! This overnight oats recipe is packed full of goodness- the light coconut makes the oats rich and creamy, the banana adds natural sweetness and the matcha is subtle in flavour and delivers all the energy and nutrients! Stir all ingredients except for fresh berries together in a small container. Refrigerate overnight. Before eating top with fresh berries and enjoy! 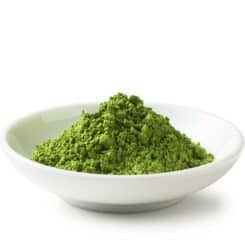 Note: It is important you buy the matcha green tea powder from a high quality source so you receive the full health benefits and also so the flavour is not bitter. Low quality matcha can be very bitter. 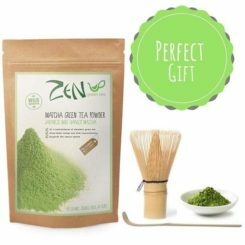 You can buy Zen Green Tea premium, Japanese matcha green tea powder for the best price in Australia here. This entry was posted in Matcha Articles, Matcha Recipes. Bookmark the permalink. 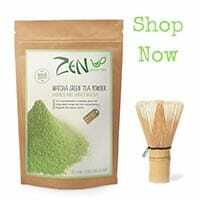 Zen Green Tea was founded in 2012. We are a small Australian owned and operated company that imports only the highest quality premium grade Japanese matcha to Australia and around the world. Thank you for visiting us!